Dual Classic winner Winter graced the Qatar Goodwood Festival today, and duly led home her five rivals in the G1 £ 600,000 Qatar Nassau Stakes for fillies and mares over 10 furlongs. The Aidan O'Brien-trained filly, ridden by Ryan Moore for Sue Magnier and Messrs Tabor and Smith, joins a long list of fabulous females who have won the famous race. It was her first attempt at the trip, and on the stamina testing, softened ground her performance could not be described as electric, but she was easily best, winning by one and a half lengths from Blond Me and Sobetsu, who was a neck back in third. Winter was returning after a break following victory in the G1 Coronation Stakes at Royal Ascot in June, and O'Brien said: "She's made the transformation from the first half into the second half of the season, and she's won well on the ground, which is like winter jumping ground. It's a different level of fitness you need for it, but she's obviously very good. "Dermot, who rides her at home, was delighted with her, but she's a filly we can still look forward to in the second half of the season. Getting a mile and a quarter that well opens up a lot of options for her, and she might even get further. "I was holding my breath all the way, because she was keen in Ryan's hands to start with, and he did a great job to relax her. I knew he was going to wait, but when you get to the final two furlongs in that ground you don't know what's going to happen. She's just very classy. "The lads [her owners] will decide on her future, but she has an option of Leopardstown [entered in Matron Stakes and Irish Champion Stakes] or York [entered in Juddmonte International and Yorkshire Oaks] now she has won over a mile and a quarter." Winter is a daughter of Galileo, one of the world's greatest ever sires, and who stands at Coolmore Stud in Ireland, which is owned by John Magnier. She was foaled by Laddies Poker Two, who was also owned by Winter's owners, and who won three races for trainer Jeremy Noseda. Following the birth of Winter, Laddies Poker Two was sent back to Galileo four more times - she subsequently had three more fillies, including Snowflakes, who is now a two-year-old, and after two unplaced runs looks short of her big sister's talent, and she is currently in foal to him. Her owners are hoping the next foal will be a colt. Ryan Moore was very happy with the performance of his charge, and reflected that after the race: "Obviously, Winter has an incredible record this year. 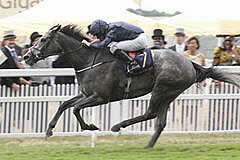 Two Guineas and a Coronation Stakes. We thought 10 furlongs would be OK for her but the ground was a worry - it is very bad. "You never quite know how any horse is going to handle ground like that. It would have blunted her a bit today but in the end she was well on top. I didn't want it to turn into too much of a slog. "It took a while to get there, but I always knew she would. "She travels beautifully, she is a high-class filly. I always thought she would pick the other fillies up. "It is just in this ground you are not quite sure, they're not sure where they are going to put their feet. Sometimes it is just one bad step and the race is over."